Gkuep1945 used to edit the Start Menu from inside XP's Windows Explorer, and now asks the Answer Line forum how to do that in Windows 7. If you're doing major work on the Start Menu--moving shortcuts around, deleting several of them, creating new submenus--you'll find the chore much easier to do in Windows Explorer. There, all the shortcuts are files and all the submenus folders, and everything is clearer and easier to work with. I should explain that I'm talking about the Start menu's All Programs section--the place where you'll find shortcuts to all of your installed programs. You can't edit other parts of the Start Menu this way. 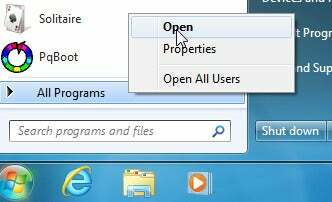 XP and Vista users can open the Start Menu in Windows Explorer by right-clicking Start and selecting Open. But that option caused considerable confusion for some users, who thought it was the default way to open Windows Explorer and complained that it always brought them to the Start Menu folder. So Microsoft "fixed" the problem in Windows 7 by replacing that option with one that opens Windows Explorer to the Libraries folder. So how do you open Windows Explorer to the Start Menu folder in Windows 7? Click the Start orb, right-click All Programs, and select either Open or Open All Users. The first option takes you to a Start Menu folder that contains items only visible when you're logged into Windows with your name. The second option opens a folder of items available for all users of your PC.